Last night was a restless one for yours truly, and in one extended patch of sleep, I dreamed briefly about dynamic Russian Edmonton Oilers forward Nail Yakupov. Perhaps last night’s breaking news of the trade of Oilers Kaptain Shawn Horcoff to Dallas sparked something in my unconscious dreamzone, I can’t rightly say. 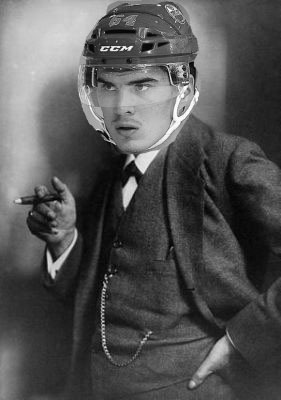 But I will lay out the detail of this Yakupov dream without interpretation or judgment, and let any amateur psychoanalyst who stumbles upon it speculate on my mental state as they will. The dream-frame, as it were, was a television broadcast of some sort (my dreams are often couched thusly, like that odd faux-documentary on pink German-made anti-Frankenstein-monster foam my brain conjured up once upon a time). It constituted coverage of an international hockey tournament of some sort, a mixture of the yearly senior and junior world championships (I recall an in-game clip of Oilers farmhand Chris Vande Velde scoring on a point shot only to have the goal disallowed, which seems like a decent summary of his marginal NHL career to this point). The lead-in to Yakupov’s appearance was a montage of free time activities of players from teams already out of the t ournament, showing them drinking, playing ping pong, setting off fireworks, and proposing to their girlfriends (the latter two were combined into one act with the fireworks spelling out a rather lengthy proposal message, which seems like an original idea, if a bit lugubrious). After a short, wary introduction (these guys don’t seem too sure about him), Yak City himself stands among these bro-ish off-duty athletes, attired nattily in a suit coat and open-collared dress shirt and expounding on some subject or another. The program shortly cuts away from this social tableau and to a documentary-style interview with a seated Yakupov (I recall an onscreen title to the effect of “Nail Yakupov – Gentleman”). Evidently more comfortable speaking his mind in Russian, Yakupov’s words were imparted via subtitles, and covered his eclectic interests away from the game of hockey. He first lamented that, due to his move to North America to play in the NHL, he had to give up his favourite pastime of ranching and riding llamas in his native Tatarstan. He expressed concern that he may have to sell off the property altogether, ultimately. He explained eloquently that being a substantial landowner is a vital factor in a Russian hockey player’s sense of identity and self-valuation, a form of conspicuous consumption used to measure his success against that of his peers. For example, Dallas Stars defenceman Sergei Gonchar, Yakupov tells the hidden interviewer, has title to most of the territory east of Krasnoyarsk, which he rules as a semi-independent duchy. But Nail Yakupov is a sunny sort by nature, and has other sideline projects to keep this sort of thing from dragging him down. For one, he’s establishing an architectural firm called McElroy & McYakupov. He considers the Scottish affectation important, as it is well known in architectural circles that Scots have an appreciation of fine lines and cutting-edge design and the name will help to build a client base. Furthermore, he’s looking forward to re-organizing the discourse in the Oilers locker room along the free-thinking dialectic principles of the Socratic Method, though he acknowledges that this may take some time to implement. At about this point, the particulars of the dream fade, and no more can be recalled. Again, I will abstain from analysis, but I think it’s fair to say that Oilers fans can safely add these fascinating details to the growing popular legend of Nail Yakupov.